Happy New Moon in Cancer! 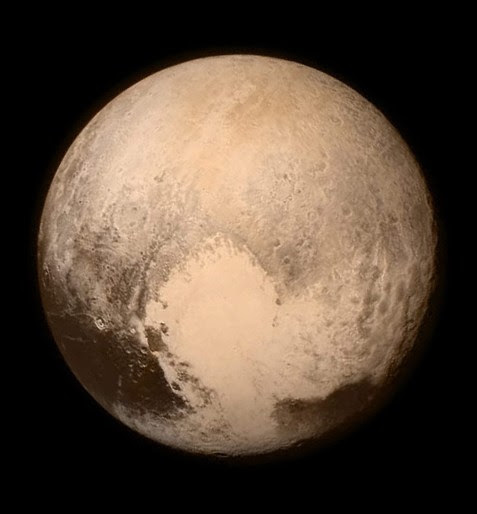 Today’s NASA picture comes all the way from Pluto and the New Horizons Spacecraft. ©2015 Richard W. Bredeson. All rights reserved. How exciting that we are getting pictures of Pluto from close up? Wow! As we learned with the Hubble Space Telescope, what we can see from Earth can be distorted by the atmosphere. But having a spacecraft camera travel that far to take a close up shot is very exciting. What will we learn? Yesterday’s New Moon in Cancer happened at 9:26 pm Eastern Daylight Time. This means that the Sun and Moon are together in the sign of Cancer and the Earth’s shadow covers the Moon so that it does not reflect Sun’s light. The Dark of the Moon is a special time of potency. We, on Earth, are receiving pure Moon energy – feminine, nurturing, emotional. We are invited to ask ourselves ‘What feeds my soul?’ Look at your values and how they are being demonstrated by how you spend your time. Do you need to do some adjusting in your priorities, in your schedule? In addition, Mercury, Mars, Uranus and Pluto are playing together in the second half of July to give us a chance to make the visions of the 60s about peace, equality and the environment become grounded in the 21st Century. What can you do? This is a special month for our family! We have two grandchildren having birthdays, Makayla (18) and Tristan (1). What a joy grandchildren are! And we get to celebrate with both of them! And on July 22nd Rosemary & I celebrate our 32nd Wedding Anniversary. We will celebrate all of these special days! Sneak Peek: This Fall we will be offering a free telesummit, exploring with successful entrepreneurs the spiritual practices that keep them centered and balanced. Stay tuned for more info! If you enjoy these posts from Rosemary’s MoonLetters, please share them with your friends and invite them to get their own copy. When you Subscribe Here you also receive a gift from her, a 7-minute meditation to help you ease out of tension and stress!